Description: Sexes similar. 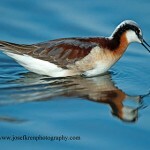 Distinctive breeding plumage of rusty back; black wings; white finely streaked throat, neck, and breast; black belly. Black bill is longer than head and slightly decurved. In winter, shows a dark gray back; light gray breast; and pale underparts. 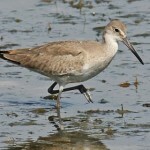 Juveniles are dark brown above; and buff below with streaking on breast and sides. 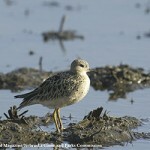 Habitat: Migrants can be found on mud flats, shallow ponds, and open muddy shorelines. Where in Nebraska: Occasional spring migrant in eastern part of state, becoming rarer in western Nebraska. Rarely seen during fall migration. 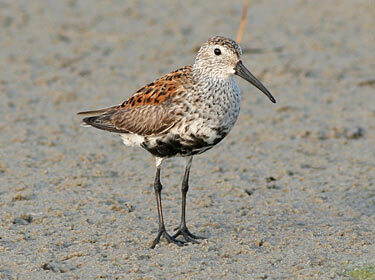 Field Notes: Often seen in flocks of other small sandpipers. Fun Facts: The Dunlin travels from its wintering grounds in Central America to their breeding grounds in northern Canada, traveling thousands of miles twice a year.